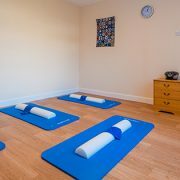 Join us for a fantastic hour of Gentle Holistic Yoga….Asana practice, Pranayama , Meditation and Relaxation. Aimed at those of you needing to unwind, de-stress and rebalance. Fantastic for those of you coping with pain, anxiety or low mood. Jackie Robinson is a very popular teacher throughout the Rame Head with nearly 30 years experience of yoga. Open to all. Small classes of 4-5. 1 hour classes on a Friday afternoon. £12 per person. Contact us at the clinic to book your space. © Copyright - Saltash Physiotherapy. Website: Skim.